Cradle cap is a skin condition that can affect babies and children at various ages but is more common during the first year. It isn’t pretty, but it’s not harmful either. 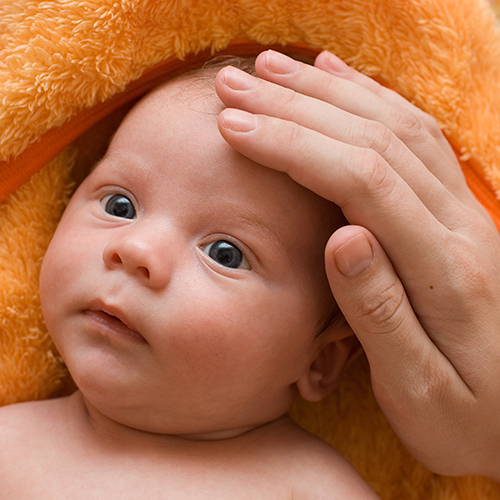 Find out more about cradle cap and how to care for your baby’s scalp. Sometimes cradle cap can look like bad dandruff, but it can also present as scaly yellow or white patches on the scalp. The skin may have greasy or waxy looking patches, or crusty areas. Cradle cap can also sometimes affect the eyebrows. 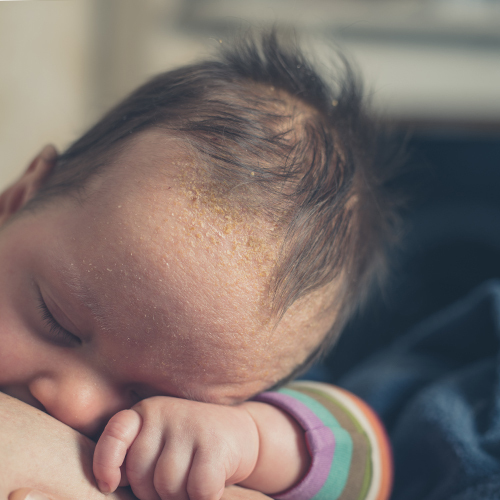 If left untreated, cradle cap can cover the whole of the top of the head like a hardened shell or ‘cap’, giving this condition the name ‘cradle cap’. Although it can look unsightly, cradle cap is harmless. It is not usually itchy or painful and shouldn’t cause your baby any discomfort. The same sort of skin condition could also appear on your baby’s face and around the ears. Here it's usually referred to as seborrhoeic eczema or seborrhoeic dermatitis. It results in damage to the outer skin layers known as the epidermis. This can take many weeks to resolve which is why it is important to use carefully selected products and follow a ‘water only’ regime when bathing your baby during at least the first month of life. By doing this you reduce the risk of inflammation, allowing the delicate skin barrier to protect your baby. Whilst cradle cap is common in young babies, older toddlers can be affected too. Similar scalp conditions can also be seen in elderly people later in life, whose skin becomes extremely delicate. 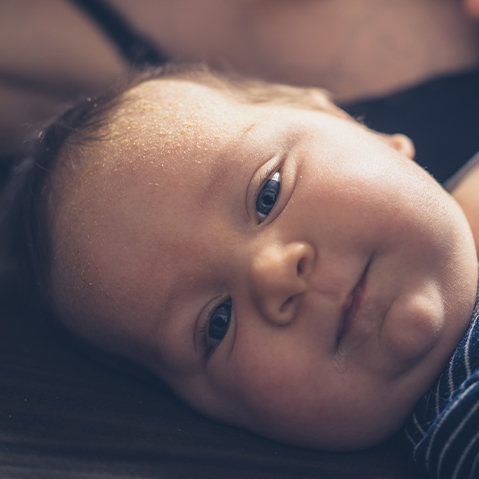 Why does my baby have cradle cap? Babies can’t catch cradle cap from another infant, so there’s no need to worry. Your baby may be more likely to develop cradle cap if there is a family history of allergic conditions such as eczema. Babies commonly experience cradle cap from a couple of months old to around a year. It’s not certain what causes cradle cap, but it is thought to be caused by overactivity of the sebaceous glands in the skin, due to increased circulating hormones from the mother. Use of harsh skin products in the early weeks of life may also result in cradle cap. Oily secretions make the skin cells stick to the scalp and form a crusty layer rather than just flaking off unnoticeably. These secretions tend to reduce over time, which is why cradle cap usually clears up on its own. Some people recommend regularly washing your baby’s hair to get rid of cradle cap, but at Weleda we are also very aware that a dry flaky scalp can be exacerbated by using the wrong products such as foaming detergents often found in shampoos and bubble baths, which are drying and upset the skin’s natural balance. By avoiding these products there is much less chance your baby will develop cradle cap. So at Weleda we recommend washing your newborn in plain water for at least the first month of life. 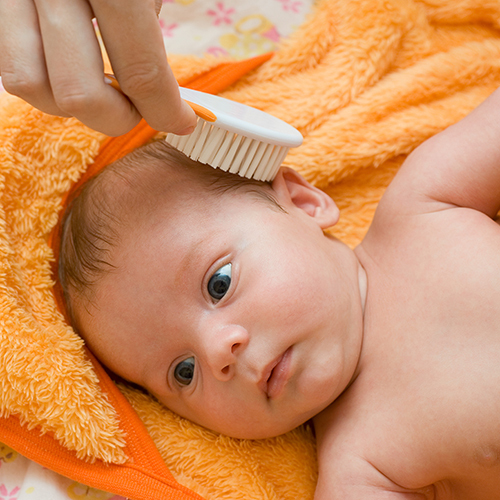 We advise not washing your newborn’s hair in anything but water for the first few weeks. You may find you can continue to wash your child’s hair with just water for many years and there is no need to introduce shampoo for quite a long time. But if you do choose to introduce a baby shampoo then we’d recommend something natural, avoiding foaming agents such as SLS or SLES. Don’t be tempted to use the family shampoo on your baby. 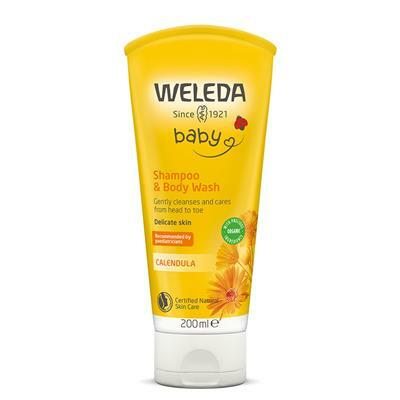 The Weleda Baby Calendula Shampoo & Body Wash is very gentle on skin and scalp, and due to the moisturising plant oils of sesame and almond it won’t dry your baby’s scalp. How do I treat my baby’s cradle cap? Rub a mild fragrance-free and ideally organic quality baby oil into your baby's scalp. We recommend leaving the oil on overnight and then gently loosening the flakes in the morning using a soft baby brush. It is tempting to pick at any remaining scaly or crusty patches on your baby's head, but try not to. Picking at it can leave sore patches that could become infected. If your baby is prone to a dry and sensitive scalp, treating the scalp regularly with Calendula Baby Oil may help prevent this worsening. If your baby's scalp starts to look red or inflamed, or the skin looks weepy, ask your midwife or doctor for further advice. “It’s tempting to turn to a baby shampoo to try and wash off the scaly skin that forms on the scalp. But shampoo and water can dry the skin and exacerbate the problem. The best solution is to soften the cradle cap with oil, ideally overnight, and then when the ‘cap’ is softened gently coax it away from the scalp with a clean fine-toothed comb. Repeat over a few nights if necessary. Stronger medicated shampoos aimed at the treatment of cradle cap should be avoided”. Elderly people who develop similar dry flaky scalp conditions in later life may also find the Calendula Baby Oil useful to nourish the scalp. Gently rubbing in a little oil once in a while to treat the scalp should help prevent dryness. The gentle Weleda Baby Calendula Shampoo is also suitable for older people with very delicate skin and scalp. Is the Weleda baby oil suitable for cradle cap? Weleda’s certified organic fragrance-free baby oil contains no essential oils and is ideal for newborns, and can be used safely to care for your baby’s scalp and to treat cradle cap. Golden orange calendula petals, famous for their skin healing properties, are blended with cold pressed organic sesame seed oil to keep your baby’s skin soft and smooth and helping to prevent skin irritation and soreness. Sesame oil is rich in nourishing fatty acids and protective vitamin E. At Weleda we grow own calendula plants organically to ensure freedom from contamination by chemical fertilisers and sprays. The result is a top quality, light oil that’s easily absorbed by the skin and well tolerated, with no artificial ingredients of any kind - no fragrance, no mineral oil or petroleum derivatives, no colorants, preservatives or parabens. The product is NATRUE-certified organic and has been dermatologically-tested for suitability on easily-irritated skin prone to eczema and dermatitis. Not surprisingly, many midwives recommend it. For generations little rosy cheeks and peachy babies bottoms have been enjoying Weleda’s vintage baby oil which was first introduced in 1959 and celebrates its 60th anniversary this year!